Has your family been trying to figure out some rules to govern screen time? Finding the correct formula for limiting the use of electronic devices in order to improve the quality of personal interactions and communication has become a priority for many families. What’s at stake is the limited and precious resource of our attention. Attention is the psychological process we use to focus on what is most important to us. In families, attention is a fundamental demonstration of love, validation and communication. 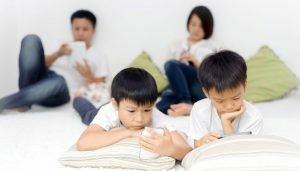 Families are racking up more screen time than ever before and many are beginning to develop strategies for ensuring that important family relationships, and child development, are not damaged by the addictive distractions of screens. When we withdraw our attention from a person we are talking to- in order to engage with a device for an update on calls, emails, or news- we are disrespecting that person. Parents do it when they check their work emails at home while talking to a child. Children do it when they won’t look up from their device to talk with their parent. We know this but we do it anyway, not so much by choice as by (bad) habit. We are the first generation in history to contend with the interpersonal distractions posed by having instantaneous 24/7 access to an ever expanding and compelling universe of information. As a result, parents are starting to look for strategies to protect their familes from the unintended and uncharted consequences of electronic disruptions to the fabric of family life. The AAP approach emphasizes that it’s not just the children who need a plan for limiting media. A viable plan should address the adults in the household as well. When discussing this topic at one of our staff meetings recently the conversation was incredibly animated. Our team is a diverse group including parents of babies, toddlers, school age children and adolescents as well as parents with no children in the home. While the challenges, and solutions, may be quite different for each group, the relevance of the topic, and the impact of technology on home life and relationships, was evident across all the varied family configurations. As a result of this meeting, CompEAP has decided to pilot a facilitated discussion group, which can be presented at a company site or online, focusing on how familes are responding to the challenges of managing screen time in their homes. The program is intended as both an awareness builder and as an opportunity for individuals to share their family’s experiences, solutions and concerns in a judgment-free setting. The addictive nature of our cell phones, in particular, can make some parents feel like law enforcement officers walking a beat in their own homes. As with any addiction, setting boundaries can be incredibly challenging and difficult to maintain over time, because bad habits have a tendency to come back. We hope that an awareness group will not only provide useful ideas for parents about setting guidelines, but also will strengthen their resolve by validating the importance, and inherent difficulties, of this enterprise. Please feel free to contact me directly (msagor@compeap.com) if you are interested in bringing such a program to your company and/or if you have some thoughts about this topic that you would be willing to share as we develop the offering.